At the London Design Festival in September I was really inspired by the amount of designers and exhibition stands that were focusing on dark green this year. After looking in awe at some of the dramatic dark moody interiors on Instagram, I was really inspired to create a moody mood board and show you how you can style the ‘dark side’. As with choosing any deep colour, it can be quite a brave decision and you will have to decide if it’s right for your home. Many Interior Designers will say that it’s ok to do dark walls in a small room, and the reality is, yes, you can. But, only if you want the room to feel cosy and you don’t want, or need, a feeling of space. Dark colours will definitely draw the walls in. So you will need to decide on the feel and atmosphere that you want to create for the room. However, if you have large rooms, deep colours may be the answer to creating a more cosy, homely feel. Especially with the beautiful high ceilings and large windows that you find in Victorian and Edwardian properties. We are still seeing many Tropical and Botanical prints with wallpaper and fabrics and a fair few leopards creeping into the mix. For my mood board, I have found a compromise, between the large leafy prints and the totally tropical. 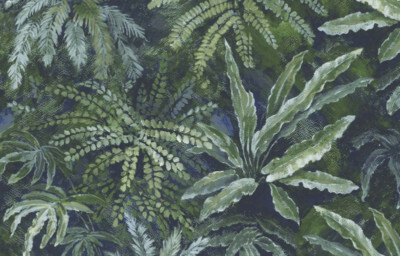 This Balearic Palm wallpaper by Charlotte Jade combines botanical trends with dark inky hues in this lovely midnight teal design. The colour pallet for this design gives it a real vintage elegance. 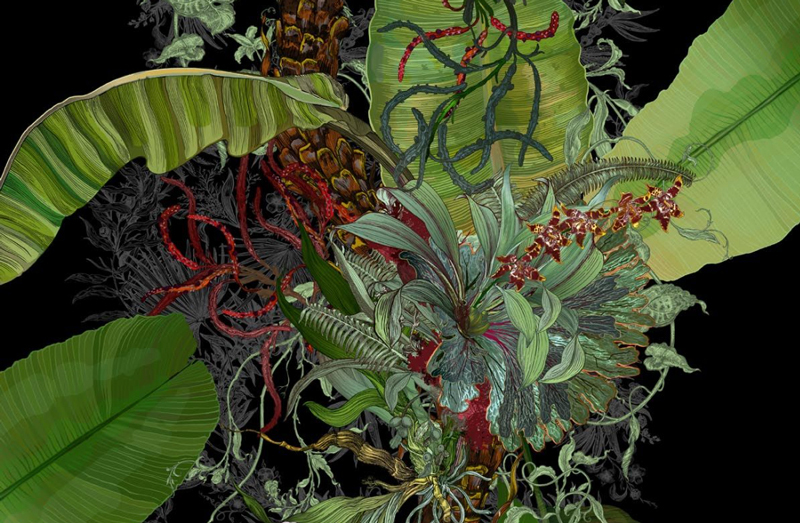 If you are loving dark Tropical prints here are other designs to inspire you from Angel&Boho, Woodchip&Magnolia and Timorous Beasties. What a great selection of green sofas there are around at the moment. I was spoilt for choice. But for this mood board the fabric definitely had to be velvet. The beautiful rich tones that you can get with velvet just can’t be beaten. I found this elegant sofa at Att Pynta. The Blanca sofa is by Swedish designer Amelia Widell. In Italian cotton velvet, it comes in three sizes from 2 – 4 seater options with matching cushions. To create an elegant room setting for my Vintage green I have kept to a limited colour pallet. The Black background of the wallpaper is echoed in the furniture and fireplace. It’s great to mix classic and contemporary styles and I love the timeless design of this cabinet. It’s elegant sculptural form is crafted in Ebonised Oak. It’s a design named ‘Self Portrait’, by young designer Jan Waterston. I was lucky to discover this unusual piece at the Celebration of Craftsmanship and Design Exhibition in Cheltenham this year. The fabulous convex mirror is by Abigail Ahern. At 127cm it’s rare that you can find a convex mirror this large. But it’s worth going for size as it to really adds the wow factor to a room. When you have a room with dark walls it’s essential to have good lighting. Along with pendant lighting wall lights or table lights will create ambient light and add to the drama of the colour scheme. Hand blown-glass looks pretty amazing and I think this Pear Drop pendant by Curiousa & Curiousa fits the colour pallet perfectly. And, why have one pendant, when you can go for two? 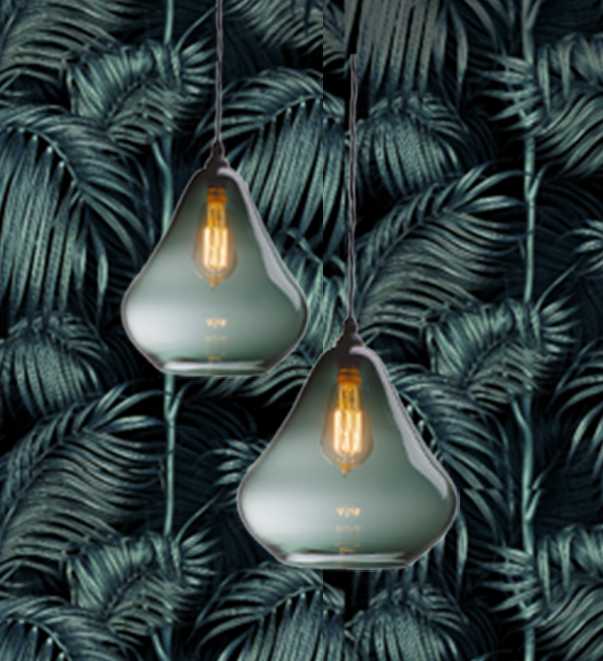 The Pear drop design comes in three sizes and being hand-blown to order is available in 23 different shades of glass. I could have gone a bit more fancy with the table light. I did look at some wonderful fringed lamps at Beauvamp. 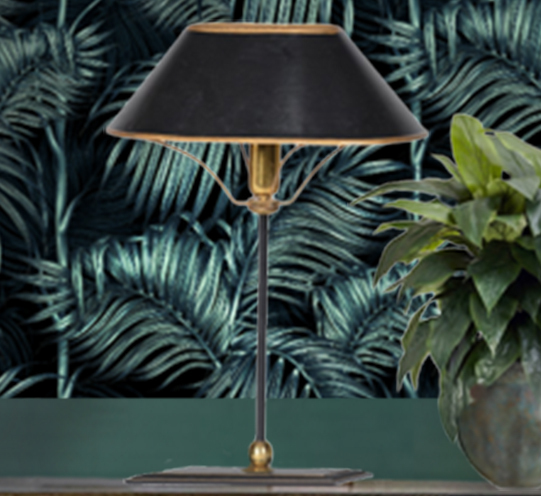 But decided on this understated Black and Gold lamp from Rockett St George which has an elegant design and slightly Art Deco feel. 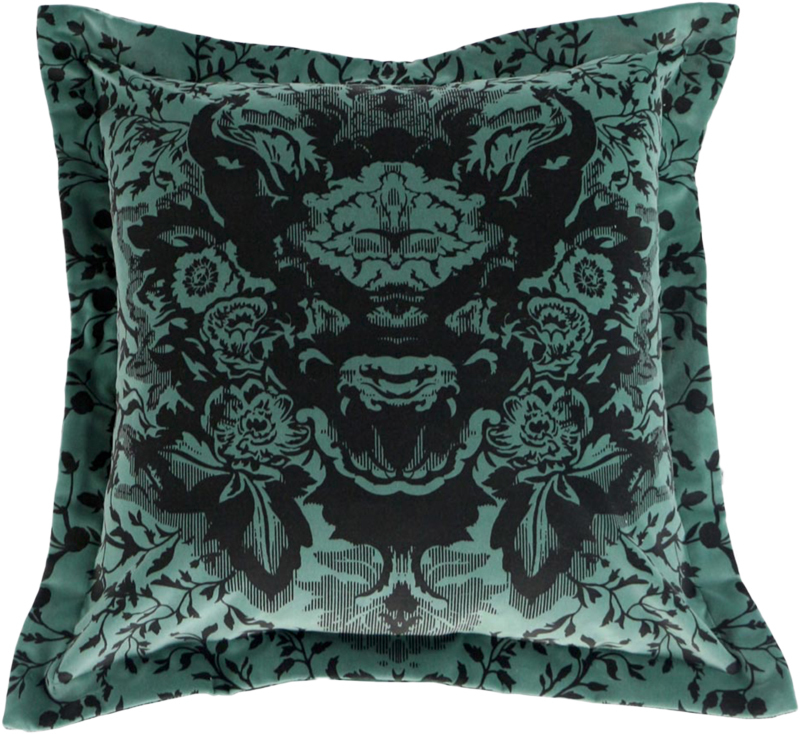 This Damask design cushion from Timorous Beasties has great matching tones and it’s always a good idea to mix different prints within a room. Most people will have a few cushions or accessories they already love – which is great to give an eclectic feel to the room. I have kept the accessories quite minimal as it makes the mood board easier on the eye. But with this kind of styling you can go for full on Maximalism ( if that’s a real word). Any vintage finds would fit right in and add to the period atmosphere of the room. I found some ideal accessories at Oka with their Jardis range. 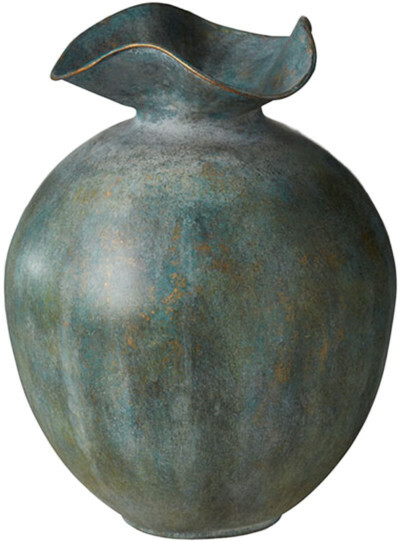 Distressed, antiqued, bronzed, ‘verdigris’ finish vases which are actually made from iron. 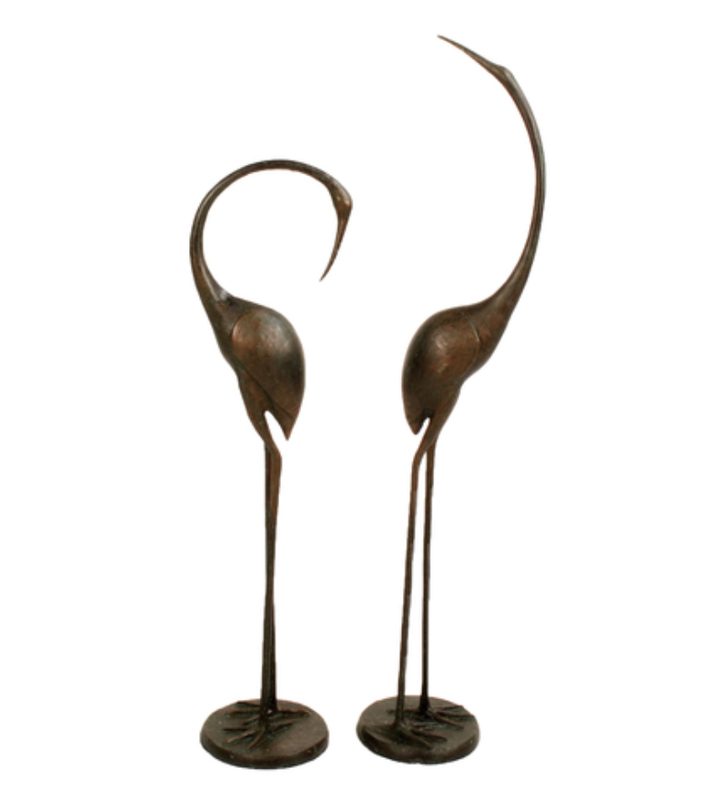 This delicate pair of cranes are in a dark aluminium Verdigris and from Ruby’s Garden. For the fireplace, any vintage candles sticks or quirky ornaments will work well. Take a visit to Portabella Road, Covent Garden Antique market or your local Junk shops or antique fairs to find some unique pieces. When the walls are dark it’s quite a good idea to go for a lighter flooring to lift the room. Most old houses have wooden floorboards that can be sanded down and finished with oil or wax. If you need to lay a wooden floor – go for a light to medium Oak. Reclaimed boards are great if you can find them or go for a slightly distressed finish on new boards to give them a vIntage feel. 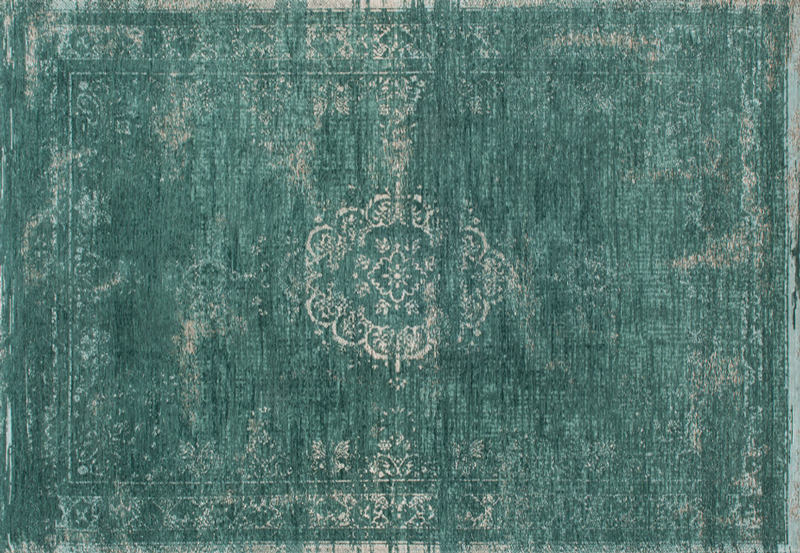 I loved the finish on the ‘Louis De Poorter’e Medallion Rug at John Lewis. The layers of woven cotton chenille yarns are distressed to give a real vintage feel. If you have a lovely period property you may be lucky enough to have a wonderful character fireplace already and will want to retain it’s character. But, if you want to create this look, a black iron fireplace will be stunning. 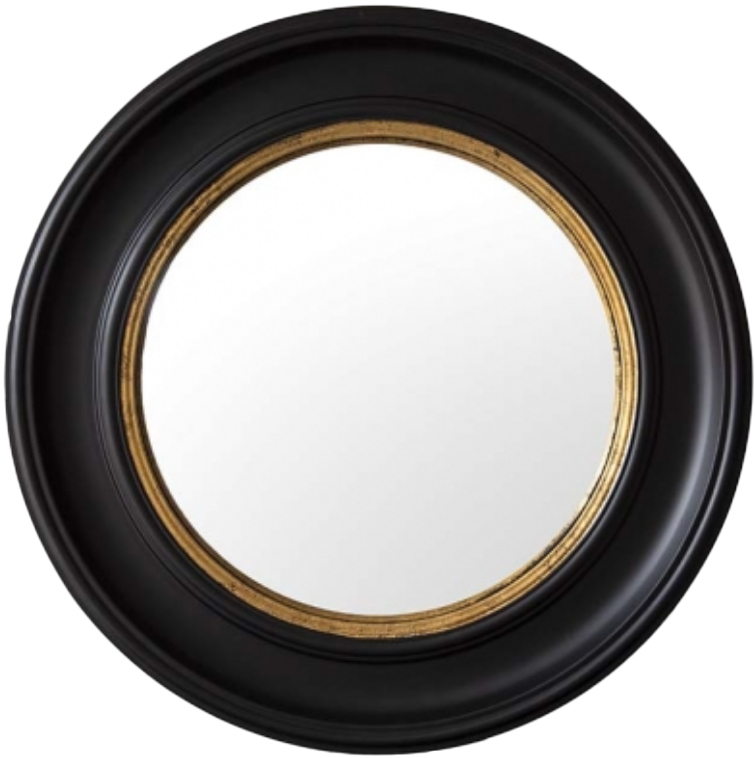 There are a large selection of cast iron fireplaces on line. Or if you have the time to visit salvage yards and look for second hand, you may find something original and quite special. The fireplace I have shown is the Carron Victorian in cast Iron from Cast Fire Places. Oh, and as for the gorgeous Dog – I would love to say ‘Stylist’s own’ – but sorry to say that’s only wishful thinking! This is really wonderful Lin, love the colour, the pattern and especially that sideboard – absolutely outstanding. A thoroughly engaging mood board I love the depth of colour. Thank you Mary – so good to hear your comments. I hope you had a wonderful holiday and enjoyed celebrating your award! Thank you Maria – it’s good to hear that you think it would work for you. I look forward to seeing it when the bedroom finished ? I don’t think I could cope with dark colours in my house – I like light and bright but I loved the rug and the dog! 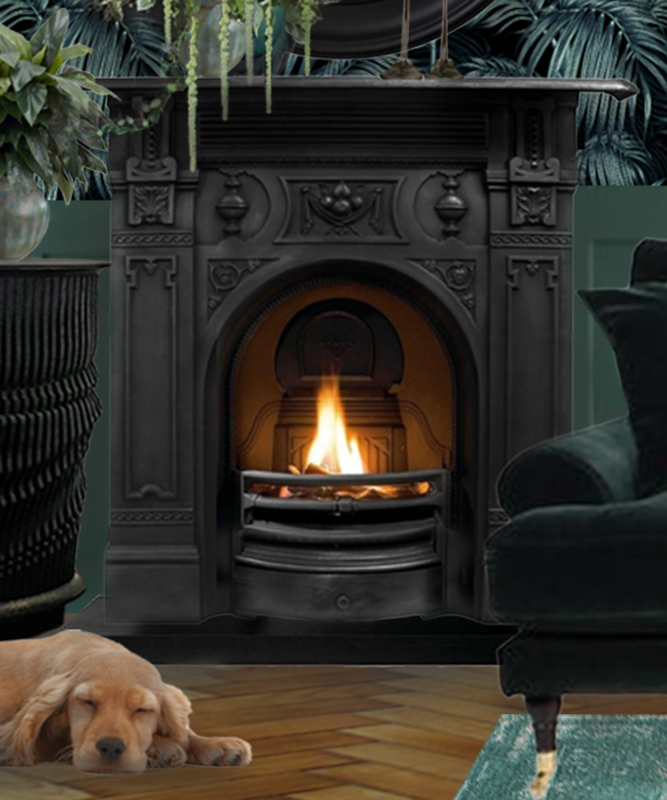 No, I don’t think dark green would work in you house Angie – but I do think the dog would look good in any room ? Wow. I love this mood board. You really are so good at mood boards Lin. Green is one of my very favourite colours for homes and I too love all these dark greens and botanical patterns that are around at the moment. Dark green is elegant, calming and dramatic all at the same time. Thank you Stacey – it’s lovely of you to say that. 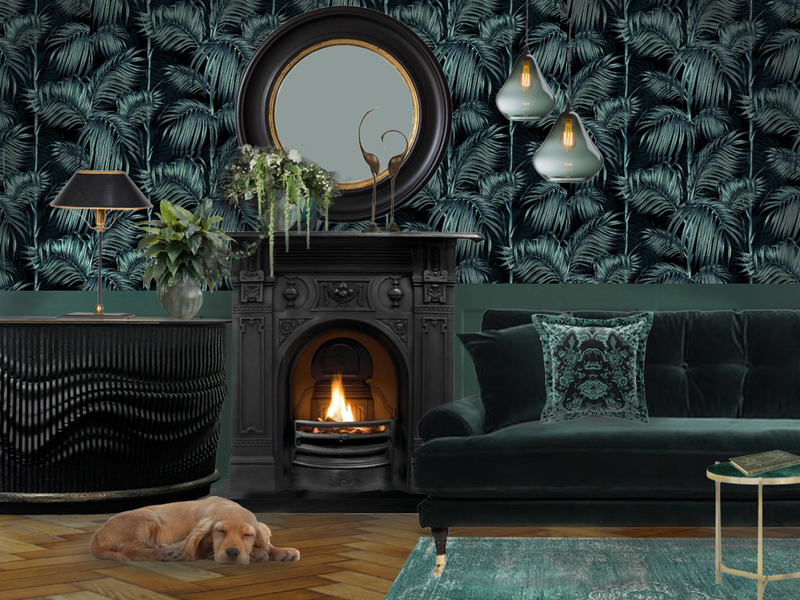 Yes, I love dark green at the moment – so it was great to have some fun to create a fantasy room. I just want to immerse myself in this room. I’m not normally one for drama but I love the power of this dark colour scheme. 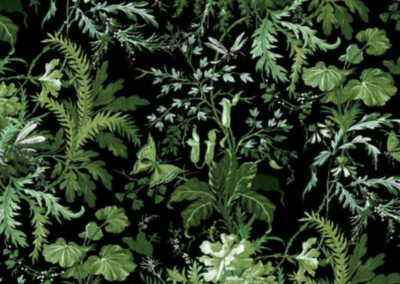 I like to have a connection to nature in my home and have a lot of house plants so I love the idea of adding foliage patterned wallpaper. You can never have too much greenery! I know Lisa – it’s lovely to see dramatic colour schemes and I feel it really needs plants to lift it – so that it’s not too moody! 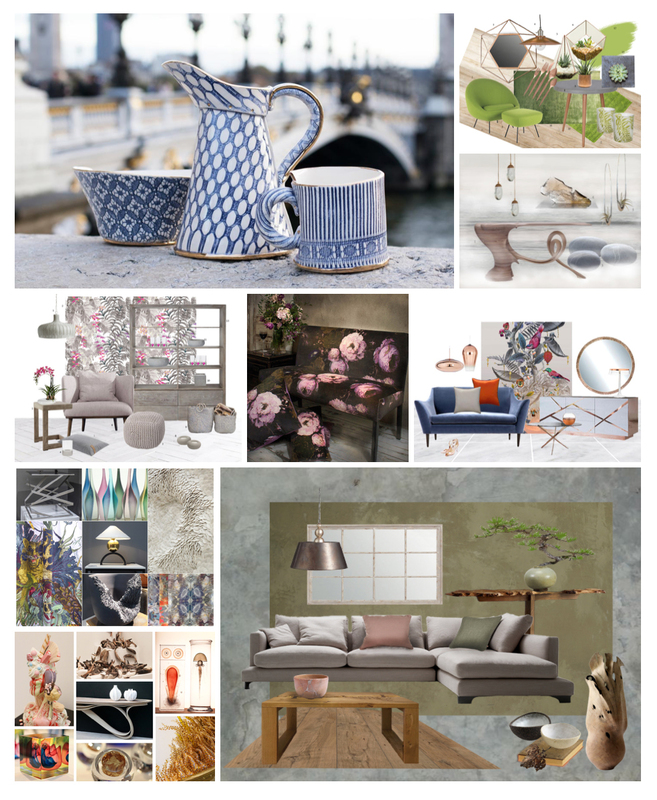 I can tell a lot of thought has gone into this mood board, so well done you for a beautiful styling suggestion. 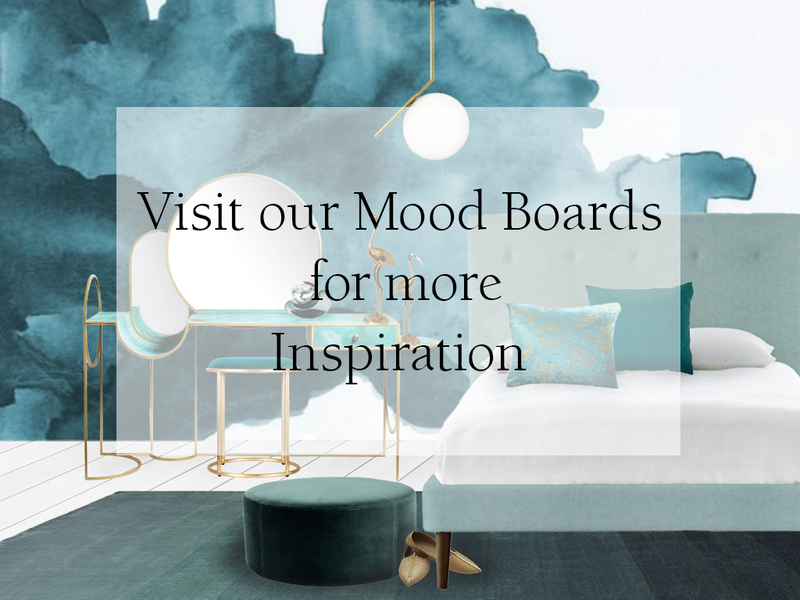 You are making it so easy fo people who love drama and dark colours with this mood board. A big fan of statement mirrors but also that cabinet is simply exquisite! Future proof! 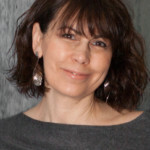 Thank you Jenny – yes a lot of time goes into finding the right pieces to create the style I have in mind. 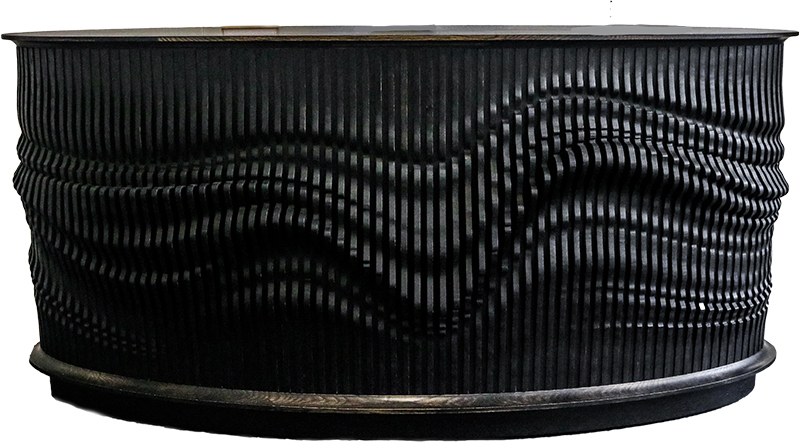 The cabinet by Jan Waterston is so unique. I love the fact that it will compliment both period and modern homes. I LOVE this colour scheme – I think it is very magical, dramatic, bold but also intriguing. I’m a big outdoors person and love being in forests and I definitely feel this experience has been translated into your scheme above! Huge fan! Thank you Catherine. I agree the inky greens colours feel very foresty – it’s a wallpaper lovely print by Charlotte Jade. 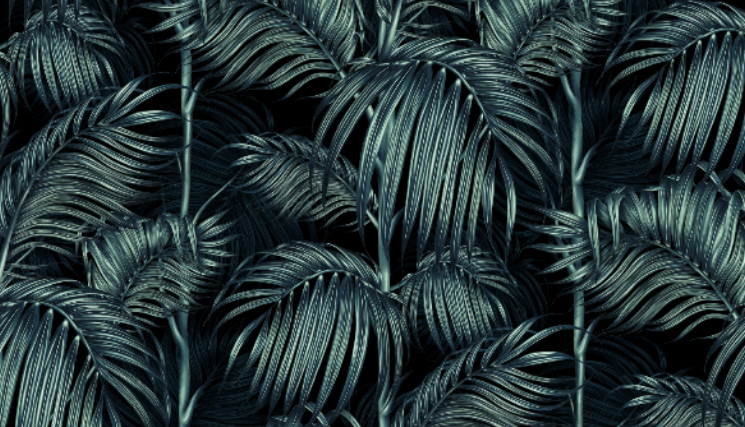 A bit of a midnight jungle feel. I love this dark vintage green, it looks stunning. You’ve picked out some gorgeous wallpaper and product ideas. Thank you Rachel – it’s great to hear that you like it! Absolutely beautiful! I love these dark greens and the botanical patterns. The overall effect is somehow dramatic and calming at the same time! Thank you Abi – I think plants can always add a calming atmosphere. Yes, don’t you just love a Dramatic colour scheme. Hi Donna that’s good to hear – looking forward to seeing your home when it’s done! I love green as of course it reminds me of our natural environment… lately I’ve been feeling the desire to bring a lot more green into my life starting with lots of plants! I’m loving those leafy prints! This look goes so well with plants- the more the better – they bring so much natural energy into the home. We live dark cozy interiors! But totally agree if trying to create the illusion of space, not always the best approach. Particularly love the Balearic Palm print in your top picks! 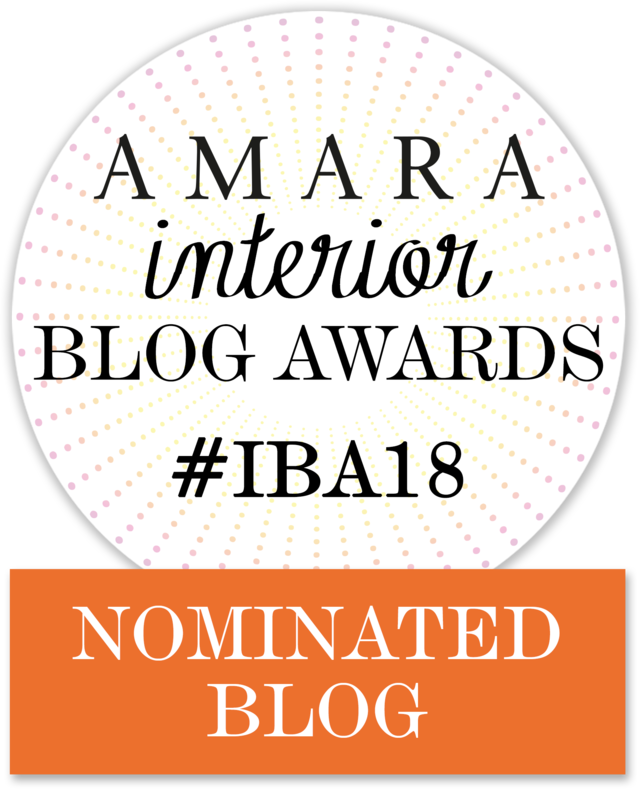 Yes dark interiors always look so beautifully dramatic – but sadly I love a feeling of calm and my home is too small for anything too theatrical!